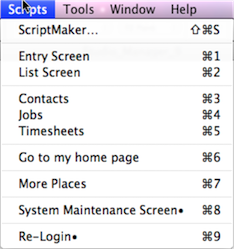 1 entry categorized "Studio Manager Tutorial"
This article is going to be brief but it is worth mentioning that there is a Scripts menu in Studio Manager that has handy shortcuts that will help you get around. Each of the menu items has a corresponding keyboard equivalent listed in the menu. Light users who may be entering time and noting the completion of tasks can zip around Studio Manager with the first 6 shortcuts. Heavier users may want to use the first seven shortcuts religiously to save time and mousing wear and tear. Entry Screen and List Screen. The first 2 shortcuts give you a way to toggle back and forth between the entry screen and list screen. If you've gotten away from your home base, you can quickly get back to the entry screen with Cmd-1 and the List screen with Cmd-2. The most common use here is to work with a list of contacts or jobs and then view the entry screens for particular contacts or jobs to work in more detail. When you are done, get back to the list screen in a hurry with Cmd-2. Contacts, Jobs and Timesheets. The three most popular places to hang out in Studio Manager are Contacts (command-3), Jobs (command-4) and Timesheets (command-5). If you want to quickly get to your timesheet or lookup a contact or job details, these shortcuts get you there fast. Home Base. We aren't playing baseball, but now that Studio Manager has links and views of all your data like your current and overdue tasks on your employee screen, it's handy to be able to get there without delay. Type command-6 and you'll get back home. Many users find having a home base a nice point of orientation to the whole system. We hope this helps. By the way, those who prefer a menu can click the little target icon at the top of the righthand button bar to go Home as well.